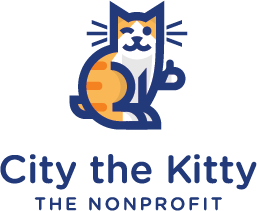 How You Tried To Educate Houston Humane Society's Executive Director About Declawing Facts - City the Kitty - Official "I’ll give you the same answer I gave the last ‘wave’, and will continue to give: Not everyone shares your view, but thank you for your opinion. If you REALLY care and want to do something productible that would affect massive numbers of animals, please put your efforts into promoting spay/neuter. Sherry"
Sherry Ferguson is the Executive Director of the Houston Humane Society. HHS does a lot of great things for animals but they also declaw cats. They do not educate the public about the FACTS about declawing and how it is harmful to the health and well-being of a cat. They do not counsel the public about the easy, humane alternatives like scratching posts, nail trims, deterrents, Soft Paws, Feliway, etc. It’s clear that Sherry Ferguson needs to be educated about the FACTS about declawing. 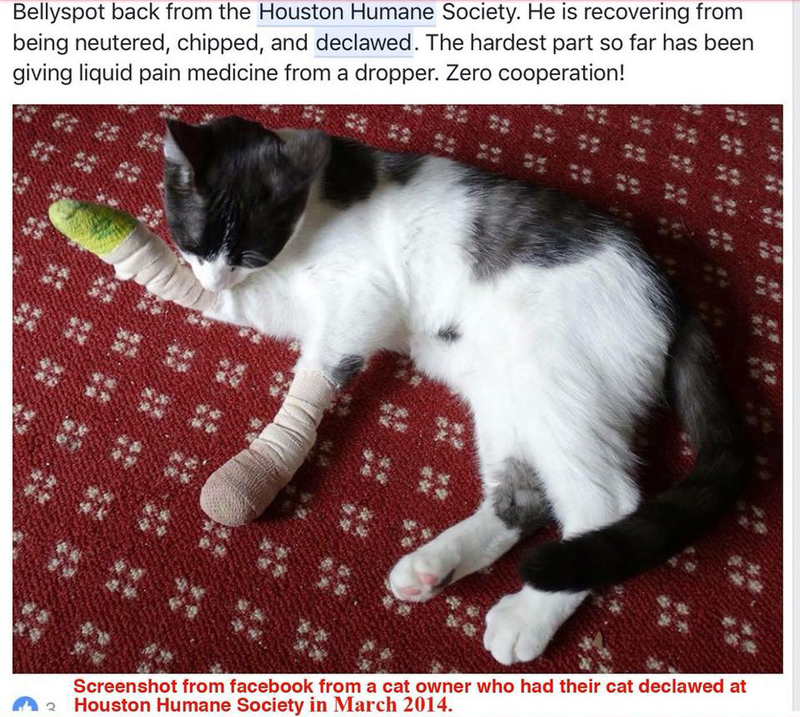 Why is Houston Humane Society declawing cats? Here’s a possible answer. Why does HHS declaw cats? Here are some of the letters that my supporters sent to Mrs Ferguson, in November 2018, and her reply. Supporter’s note to Mrs Ferguson. The Houston Humane Society must be the only HS in the nation that promotes declawing. Why? Declawing does not guarantee a cat a happy home. On the contrary. Most declawed cats suffer life long post amputation/ and phantom pain. They’re forced to walk in a way unnatural to them, and because of this, tendons in the paw contract, resulting in pain and eventual arthritis. Many develop litter box avoidance because their paws hurt from the litter. Or they become biters. Cats are digitigrades and walk on those last toe bones, Ms. Ferguson. The United States is the only country in the world that doesn’t see anything wrong in crippling perfectly healthy cats for life. Yes, the rest of the world’s cats live just fine with their claws intact and their Humans. Please do not allow this cruelty to continue. Isn’t that what the Humane Society is also supposed to do? Prevent cruelty to animals? Why not join NJ’s Humane Society, Brian Hackett, in the fight to end declawing once and for all? Reply from Sherry Ferguson, Executive Director of the Houston Humane Society. “I’ll give you the same answer I gave the last ‘wave’, and will continue to give: Not everyone shares your view, but thank you for your opinion. If you REALLY care and want to do something productible that would affect massive numbers of animals, please put your efforts into promoting spay/neuter. Here’s another note that a supporter sent to to Sherry Ferguson, Houston Humane Society’s Exec. Director. I am writing to you regarding your board member Dr. Cynthia Rigoni. It is my understanding that currently your organization performs declawing at your Wellness Care Clinics, Dr. Cynthia Rigoni also performs declawing operations at her facility All Cats Veterinary. I don’t understand why the organization performs such a barbaric process amputating a healthy animal’s digits. As part of their daily rituals, cats instinctually pull the claws on their front paws through surfaces that offer resistance. They do this to mark their territory, exercise muscles normally used in hunting, relieve stress and remove worn sheaths from their nails. There are many alternatives to deal with a cat scratching furniture or a person. Plastic nail caps, cat posts or trees, trimming a cat’s nails, playing with a cat helps get rid of the pent-up energy that a cat uses to hunt humans and their ankles. I’m asking that you stop declawing from happening at any and all facilities that are under the Houston Humane organization and that your veterinarians also pledge to stop this practice. Other organizations have stopped declawing its time for your organization to get on board as well.